Educational Qualification : Passed Graduation in any Discipline from any Recognized University with minimum 60% Marks(for SC/ST/PWD Category min 55% Marks Required) and Knowledge of Computer Application and Hindi Language. Eligible Candidates can Submit Application at the Official Website of Canara Bank latest by 13th November 2018. 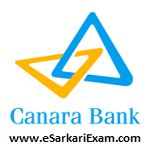 Applicants First Log on to Canara Bank Official Website. Click on Recruitment of PO in JMGS I on Specially Designed PGDBF Course Link.